If your like me there isn’t much room in the budget for all new holiday decor every time they come out with new things. I try to be very aware of what I am buying and spending which helps me to think outside of the design box if you will. Today is part two where I will be sharing some ways I stretch either my budget or what I already have on hand. Take this styled hutch for example. The only thing new I bought was the aqua ribbon and the small pumpkin on the top of the tier tray at the dollar store. The pumpkin was orange and I just painted with acrylic paint I had on hand. I only bought one spool of ribbon which gave me enough to use it in two places in my decor for this room. Giving a cohesive look. Starting from left to right I will give a quick resource for how I shop thrift stores, craft stores and even my own home. The lantern, milk white vase,beads for my garland, and small raffia ball are all thrifed pieces. 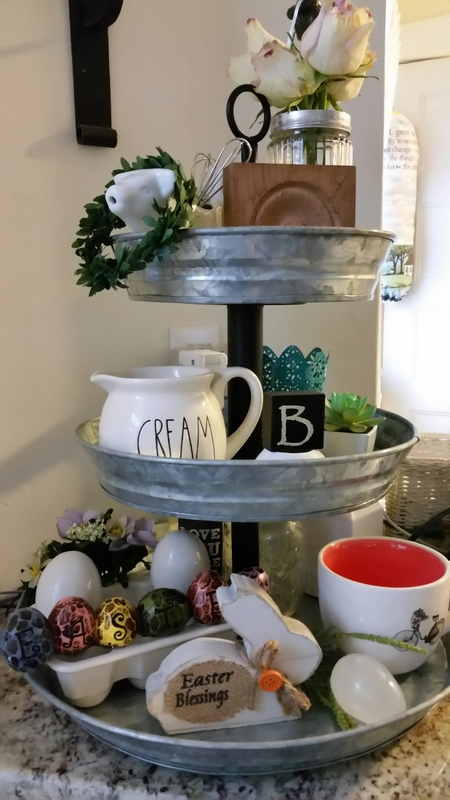 Tiered tray was a clearance find from a big box store. I love to add seasonal decor to change things up every couple of months. The yellow colander I’ve had for years. Faux apples from a discount store bought after season along with the white pumpkin spray. After season is a great time to pick up a few items you might have eyed before but now they are at a bigger discount. A word of caution don’t get sucked in by the deep discount that you over buy items you won’t use. Easy fill-ins can be found around your home. The paper straws I purchased from the dollar store back in spring. Since they are my favorite color they have worked from season to season with the rest of my decor. Things like the hydrangea flower is from my own yard. 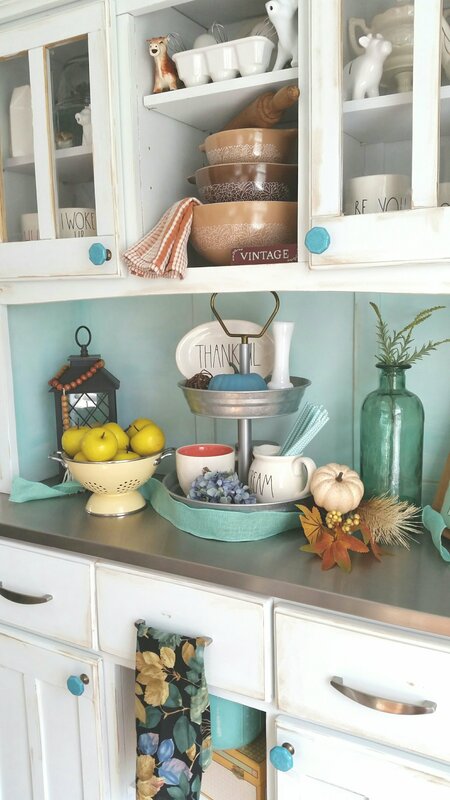 Other pieces of faux greenery help fill in gaps in your vinette. Also the glass bottle is a great piece that can be used in so many ways. So try to keep an eye out for nuetral pieces that can work in many different styling. One of the ways I feel creative is when I’m in the kitchen. I love cooking for my family and friends and I try to use healthier options. I wouldn’t say I cook or eat to any strick diet. Every thing in moderation. 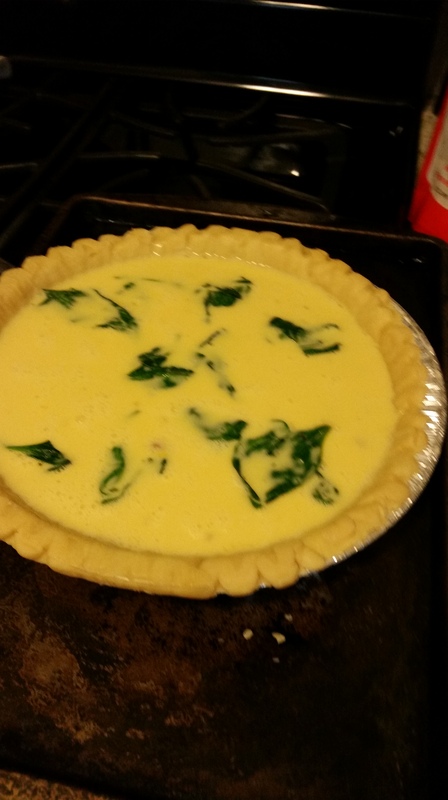 A lot of quiche recipes call for heavy cream or even half and half so instead I supplement all that fat and calories for some evaporated milk. I am always thinking of ways for my kids to eat more veggies and this is a great way to add all kinds of goodies. A quiche is a perfect dish which includes everything from protein from the eggs and any meat you add, a variety of veggies and calcium from the milk and cheese. All baked to perfection which you can eat straight from the oven or at room temperature. Take some help where you can get it with a pre made frozen pie crust. Usually they come two to a pack. Which really comes in handy for making one to enjoy now and one for later. Fresh or even frozen then thawed ingredients will work well in this recipe as well. Happy Spring! It is just around the corner with it’s promises of new life. With the new life it brings I am taking this opportunity to start living my life as I want to. I want to pursue the passions and talents God has placed on my heart. You are given one life and I am ready to stop waiting for some day to make it happen. Recently I have found that the community I am building around be is a great motivation of accountability. I am a great starter but not a good finisher. Can you relate? “Oh I can do that, make that”, or just saying yes to too many things. I need to stick to it! I will try to share some ways to stay on track and see something through to the end. The way I plan to do this is by being more selective with my time and what I say yes to. Saying yes to only what will hold my attention and understanding the time it will take ahead of time to complete that task. Set short term goals that don’t feel overwhelming. The pay off will be greater to set smaller goals. I don’t know about you but I love check lists and checking things off. So instead of writing clean basement you can write clean laundry area. It will take less time and give you a boost to move on to the next area. Stop jumping from one thing to the next! I know it’s easier said then done. Hubby hates when I have “projects” started all over the house. Honestly so do I but I can see the potential and that helps. Like I said before this goes back to starting something if time allows. As a mom it’s hard to take time to do what makes you happy but now is when you need to set limits and time for you. I know you have heard it before but you can’t fill others up if you are empty too. My last tip is to have accountability. That can come from your spouse or a close friend. Find someone who is supportive and let them know what you need from them. Another way could be as simple as making that check list. I find the best time to make it is right before bed, write down a few important tasks you would like to accomplish the following day. This helps in a few ways, first it helps to clear your head before bed and come morning time you know where you need to get started. No wasting time thinking about what needs to get done. Lastly social media is a great way to just put it out there to help hold yourself accountable for what you would like to accomplish. Hope these few tips help the next time you catch yourself jumping from one thing to the next before finishing the first thing. As a mom of two boys I can be found at the local ice rink at least four days a week. This doesn’t leave a lot of time for much else. It really helps to be organized and to plan ahead. We travel all over the state plus surrounding states for games and tournaments. I have to be honest though I wouldn’t trade it for the world. I am amazed at what my 7 and 10 year old can do out on the ice. That goes for all the kids that play the game. If you think about it, they skate on a thin blade of steel wearing equipment that probably weighs as much as they do holding a stick to push around a small 3 inch round of rubber to try and score in about 5 inch opening. AMAZING! I love the game. Through the years my boys have played many different kinds of sports but the love for hockey has never changed. From track, t-ball, basketball, soccer and even mixed martial arts just to name a few. My husband and I firmly believe it is most beneficial for them to play a wide range of sports to use and strengthen a large amount of their muscles. Most of the time they gravitate towards soccer in the off season. Off season? What is that? Ice hockey runs almost year round so it’s a big commitment on everyone’s part. Season runs from September till March but between try outs, private lessons, and summer camps it’s all the time. With so much going on I can only take it one week at a time. So usually Sunday nights I sit down with my planner and my weekly calander and plan out the week. Since I have two boys I have always color coded them ever since they were little. So on the weekly calander I write practice and game times in their coordinating colors. 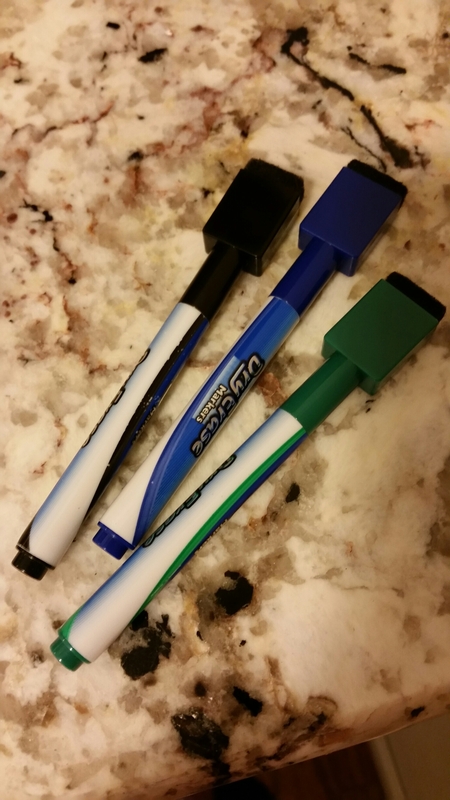 For example my older son is blue and my younger one is green. From there I can figure out dinner for the week. Which nights I can spend more time cooking and which nights it needs to be crockpot night. Now the weekends are another story. Since we are mostly traveling I try to pack snacks and drinks for the car. If I have enough time in the morning I can also put something in the crockpot as well so we have a hot meal as soon as we get home. 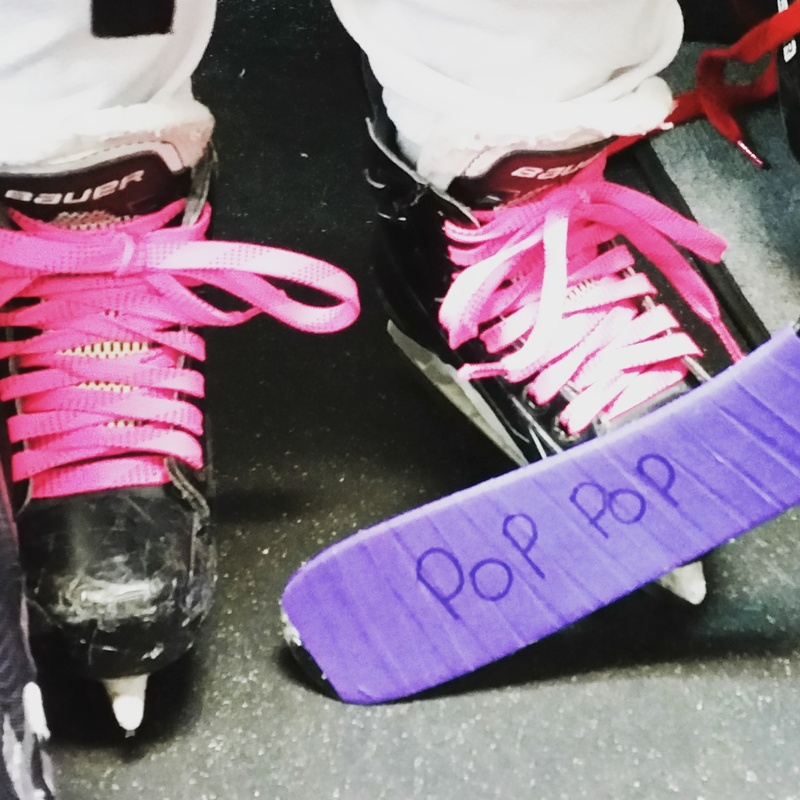 Are you a hockey mom or dad as well? What are some of your tricks for keeping up with this fast pace game? I would love to hear from you. I don’t know about you but I love to decorate! Like all the time I can re imagine a space in my head and think how I would decorate it. Am I the only one who does that? Decorating and changing the theme of a room can get costly but I have always tried to see how I can do it on a very tight budget. 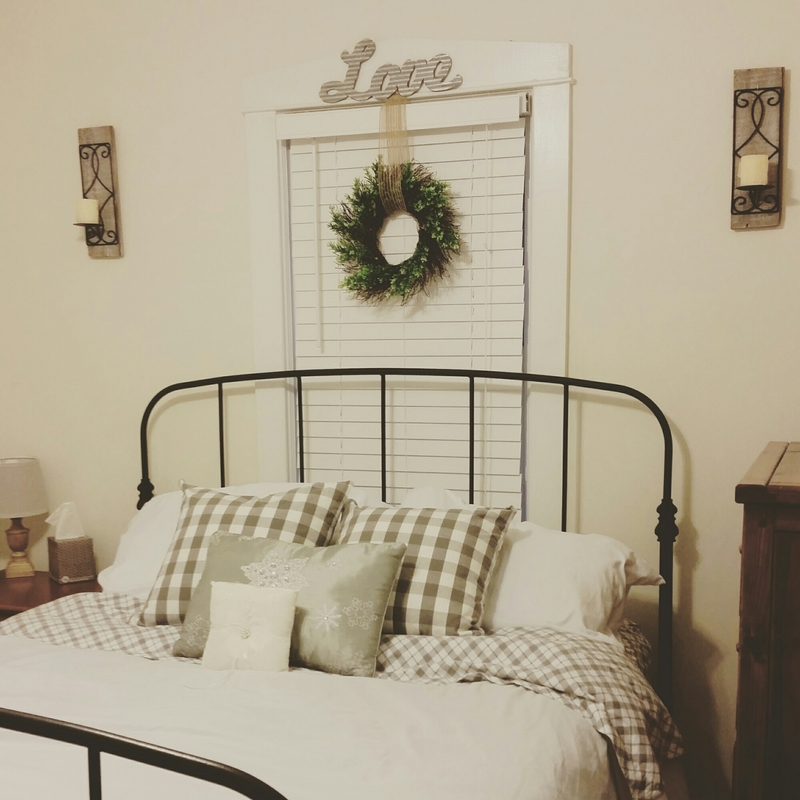 Today I am going to share with you how I took and old pair of metal candle sconces and made them work in my new rustic farmhouse style master bedroom. This pair of sconces hung in my living room gallery wall in our old house where I had it mixed in with big family picture collages and other individual shots. In our new house we don’t really have a space to make a big gallery wall some many of those items are still packed away. Like I mentioned before we moved the bedrooms around so now I am getting around to decorating our master bedroom. 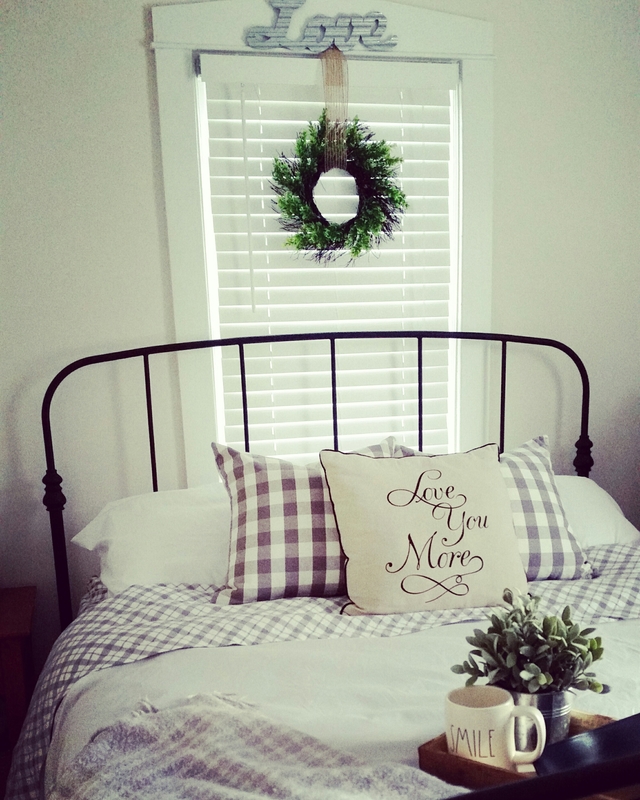 As seen on my instagram I have gone with a metal bed frame and a white duvet for the bed with a farmhouse decorating style. So now that the big pieces were in place it was time to start accessorizing which is my favorite part. Accessorizing is the finishing touches to a room or even an outfit, it’s what gives it it’s personality. 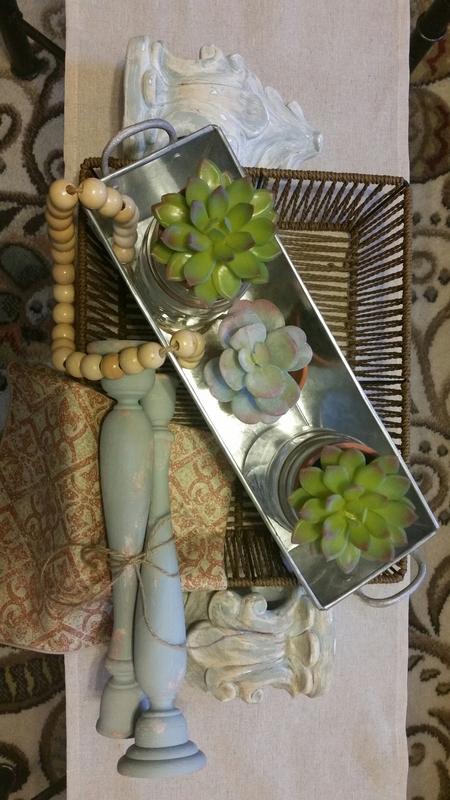 Yes we might look at Pinterest to get some ideas and try to recreate a look that we see but nothing is going to be exactly the same.The accessories come in and they might be similar in shape or color but they’re all going to be unique to your space and that’s what makes it your own. 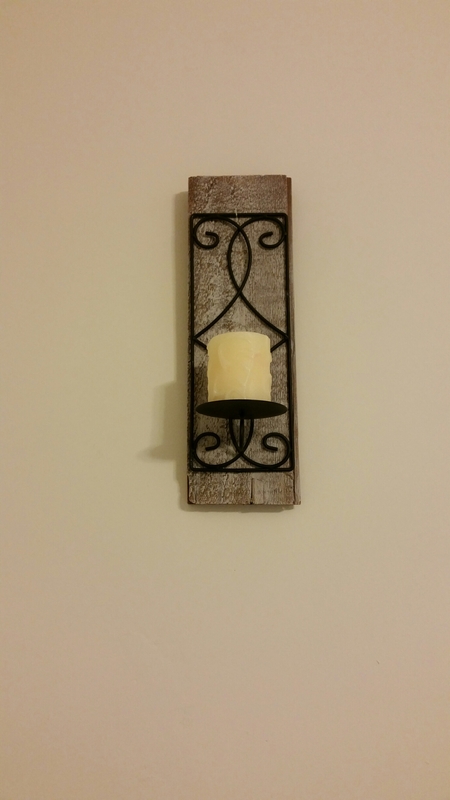 This is one of the pair of sconces I have. Pretty in its own way but to make it feel like something new for my space I came up with this little diy project. 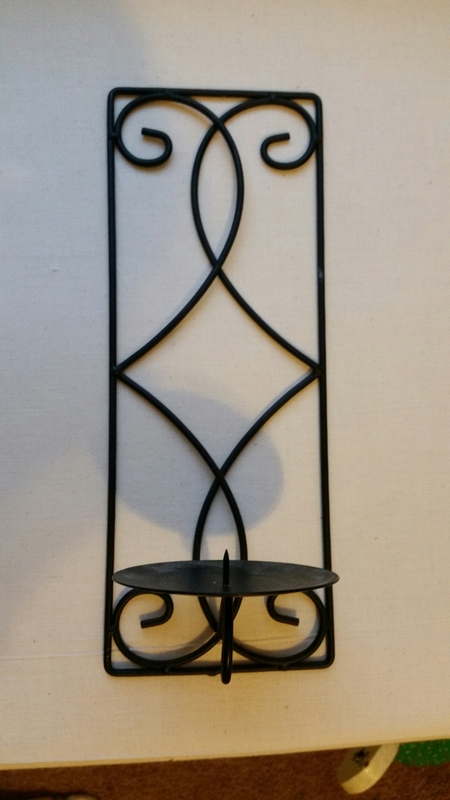 I can’t remember where I bought these but I’m sure you could find things like this either at Bed Bath & Beyond, Target or even Walmart just a simple pair of black metal wall candle sconces. I have a pallet that we took apart and cut them down into smaller pieces. The pieces I used are measuring about 14 and a half inches long. As you can see in the picture of these particular pieces of wood are not as completely weathered or rustic-looking if you will as I would have liked. So I did some destressing with some paints and glazes. 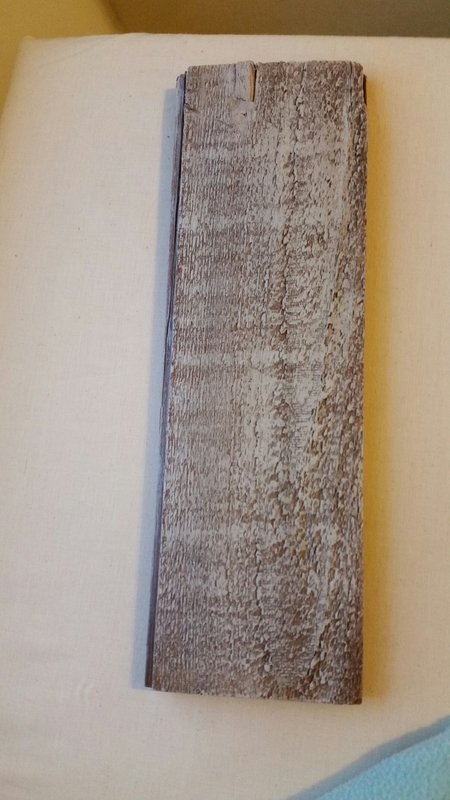 I used white and grey paint and an antiquing glaze all with a dry brush application. After it dried which only took a few minutes I then attached the sconce to the wood. 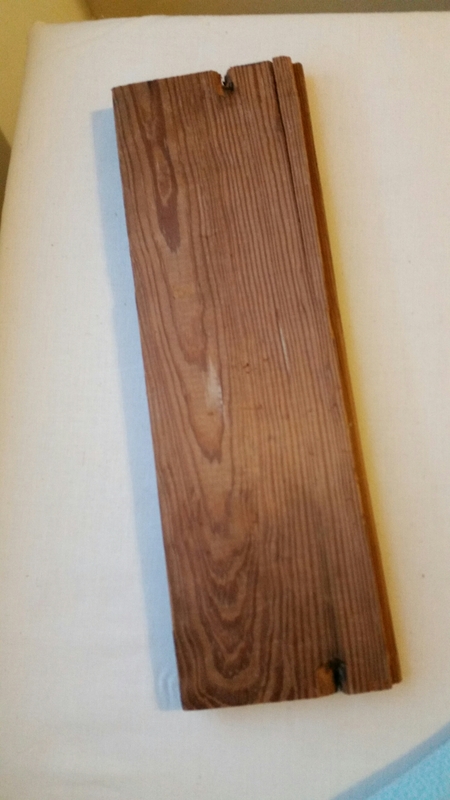 I also attached a picture hanger to the back of the wood so it could be hung on the wall. Here is the finished piece and I am just so happy with it. I think it turned out great with very little effort and no money at all. A Sunday afternoon project completed with things I already had around the house. 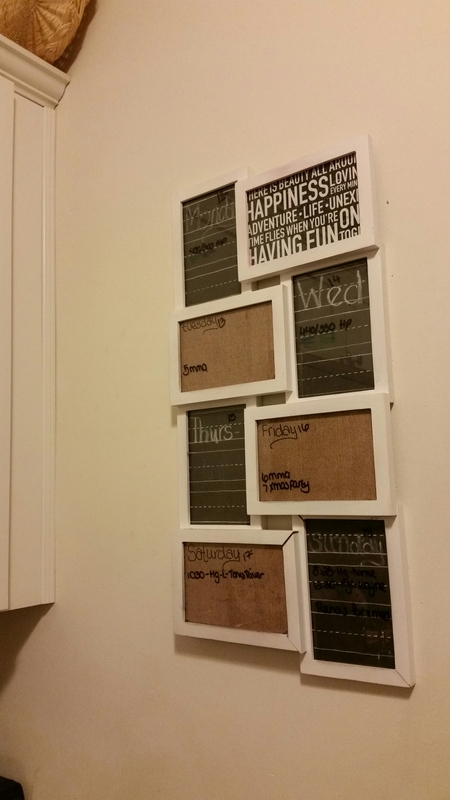 I love frugal decorating! Please feel free to share your decorating on a budget tips. Have a wonderful week friends. In the new world of Pinterest perfection it can be really hard to give yourself grace. I do have to say though I am a glorified Pinterest stalker. I love the site and everything it has to offer but with that being said it is complete overwhelm. I think I have over 5000 things pinned, again OVERWHELM! I say all of this to say that this past holiday season I had no choice but to give myself grace. This past holiday season I was down for the count a week before Christmas. Thank goodness I put the tree up before Thanksgiving this year which was a first. I also need to give a big shout out to my darling husband who really took over the Christmas shopping as well. So all I really needed to do was wrap everything. Do you like wrapping presents? I don’t, but hey it was all the energy I had to do anything. If you follow me on Instagram I mentioned that I also decided to move all the bedrooms around. All three bedrooms got a makeover. My kiddos now share the biggest room and we took the second biggest room which is tiny to say the least and the smallest became our office. Since I am trying to do more work from home now and hubby is back in school online we needed the space to do those things. After getting knocked down with bronchitis that took me almost two weeks to start to feel better from, Christmas had come and gone. I wasn’t able to give the “Christmas” experience I had envisioned in my head. The boys didn’t miss much, I mean they’re boys so they don’t need all the extra fluff like I think they do. Seeing my boys enjoy it anyway really helped me to realize all the extra isn’t necessary. All we really need is family, our health and the love we share. Hope you have a happy and healthy 2017!